Posted in: Axial, Integy, Radio Control. Tagged: RC, Upgrades. Axial SCX-10 owners can change the look of their rig and upgrade it as well! The kit includes new ladder rails, alloy transmission plate, alloy shock mounts, alloy body posts, alloy rock slider mounts, alloy upper Y-links, and a pair of HD telescoping center drive shafts. 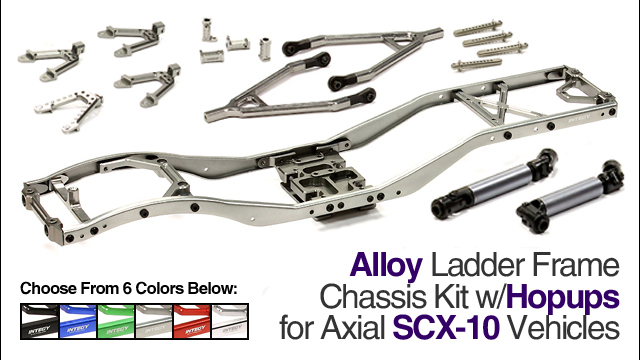 The chassis kits are available in six colors: black, blue, green, gunmetal, red, or silver.